As my parents get older, I worry more and more about their future health. My family has never been a very active one. While my mom spends most of her days on her feet at her hospital job, my dad works in an office and has been sitting for a good portion of his life. Aside from my ballet dancing when I was younger, exercise was always an "Event" in our family rather than a daily routine--to exercise, my parents would drive us forty-five minutes to this reservoir to walk a mile or two. (Arguably not the most efficient way to exercise!) And, all of us in my nuclear family have a soft spot for ice cream. So... statistically speaking, this does not bode well for any of our health(s) in the future! So this year, for my dad's birthday (and Father's Day), I decided to reinvent his favorite birthday dessert that I make him every year into something healthier. He adores maple nut ice cream, and so this time around, I came up with a maple nut frozen yogurt, accompanied by an apricot, plum, oat, and buckwheat crisp. The frozen yogurt is made with 2% fat Greek yogurt--still thick and creamy, but without the actual heavy cream, milk, and eggs. The only sugar in the frozen yogurt comes from the maple syrup, which is pretty much unavoidable when you're making maple nut ice cream. 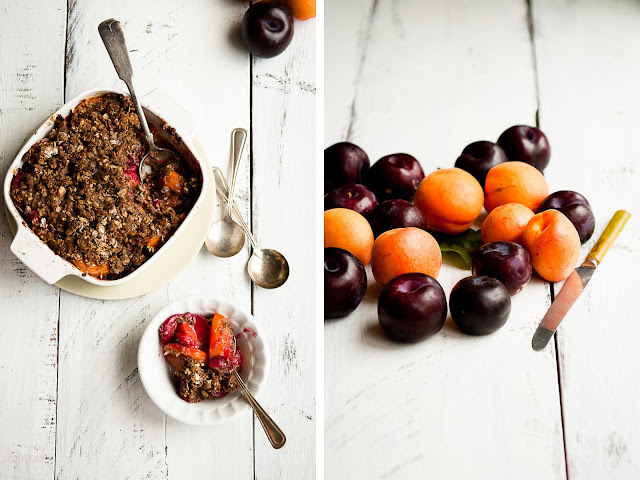 :-) As for the crisp, my family likes tart and not-too-sweet desserts, so the filling of apricots and plums really relies on natural sweetness in the fruit, with only a bit of sugar sprinkled in. The crisp topping is made with equal amounts of butter and thick yogurt to help cut down on the amount of butter needed--an idea that I 'borrowed' from 101 cookbooks. The topping is also made with no gluten--just oats and buckwheat flour, both of which add a natural nutty sweetness to the crisp. Even though this dessert was waaaaaaay healthier than my dad's normal birthday fare, it worked out really deliciously. The slight tang of the yogurt went perfectly with the sweet maple syrup in the maple nut froyo, and the crisp was bursting with juicy goodness, which mixed so well with the melting nutty froyo scooped on top--all in all, I deem this Healthy Dessert Success. Anyone have any favorite healthy dessert tips to share? I of course remain very much committed to heavy cream and butter, but it's always good to explore the options! 2. In a bowl, toss and combine all of the filling ingredients. Spoon into an 8x8" baking dish. Set aside and make the crisp topping. 1. Combine all of the ingredients except the butter and yogurt in a bowl. 2. Using a pastry cutter or fork, cut the butter and yogurt into the flour mixture until the butter is the size of small peas and evenly distributed throughout the mixture. Do not overmix. 3. Spoon the topping over the fruit in the baking dish, patting it down if you need to pile more on. 4. Bake for ~20-30 minutes, until the top is brown and the insides are bubbly. Remove and let cool briefly before serving. 1. In a small saucepan, heat the maple syrup just until it comes to a boil. 2. Add the chopped walnuts and salt and return to a boil. Stir and cook for 10 seconds, then remove from heat and let cool completely. 1. Whisk together the yogurt and maple syrup. Chill thoroughly in the refrigerator. 2. Freeze according to your ice cream maker's directions. Fold in the prepared maple walnuts in the last few minutes of freezing. 3. If needed, put frozen yogurt in freezer to continue freezing until about the consistency of soft serve, about 1-2 hours. 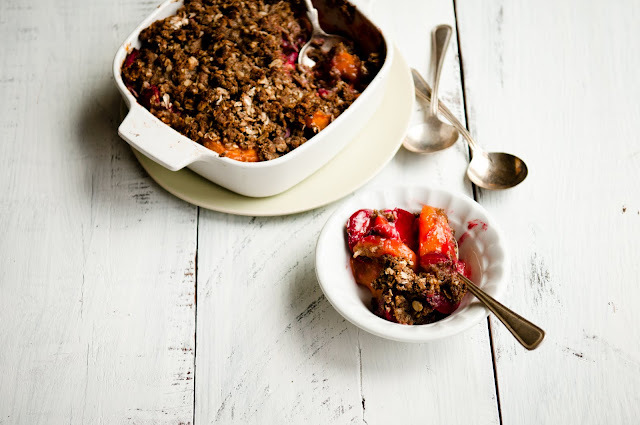 Serve with apricot-plum crisp. Wow it looks awesome and so does your photography, of course! I did recently make vanilla avocado banana ice cream. Sounds not so hot but it really is great! And healthy! This looks incredible! I love the tang of greek yoghurt, and combining it with granola is my favourite breakfast. This kind of makes me think of a sexied-up version of that! As for healthy dessert tips...I always substitute butter with canola or grapeseed oil and use honey instead of sugar. Weirdly, in a lot of recipes I think the oil works better. For example, I love making chocchip cookies, and my boyfriend is quite the connoisseur and actually prefers my healthy version to the more buttery and sugary ones - and he doensn't even know the difference! 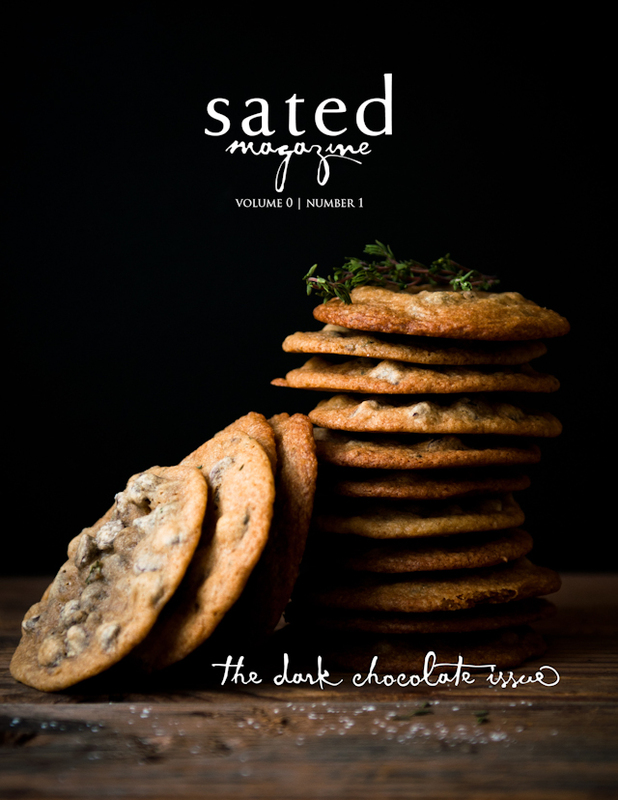 Gorgeous, the pictures as well as the recipes. 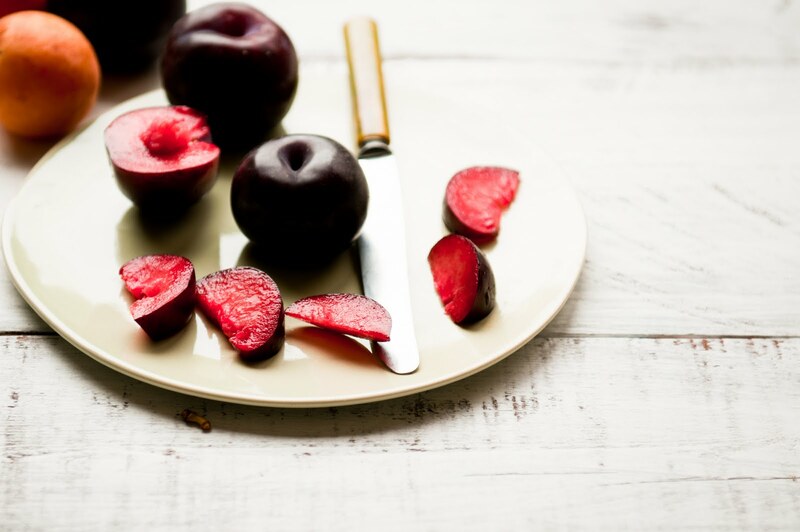 Love the plums, that would be a big hit around here! maple nut froyo?? oh wow that sounds amazing! and your photos are absolutely beautiful. this looks just as appealing as a full fat dessert! I bet your dad loved this healthier version- it looks delicious! I'm not a maple nut fan, but the crisp looks amazing! Must print to make once I get my hands on some apricots and plums! There is nothing in these recipes that I do not love. I am trying this asap. And I think we can all try and be a bit healthier. I know I can. It's always comforting to find a little bit of health in something delicious, isn't it? Gorgeous shots by the way! I've not tried this dessert before...I'm a fan of maple syrup but never heard of maple nut haha! But I'm sure your dad must love it! Looks like such a comfort dessert! I dont have healthy ideas when it comes to dessert! If i am going to eat it, i eat the full thing with heavy cream, chocolate, butter and all! But i do try to add fruit when i can. It looks like you nailed it. Delicious and healthier. You're dad is very lucky! Oh my! Looks both decadent and healthful! That crisp is insane! 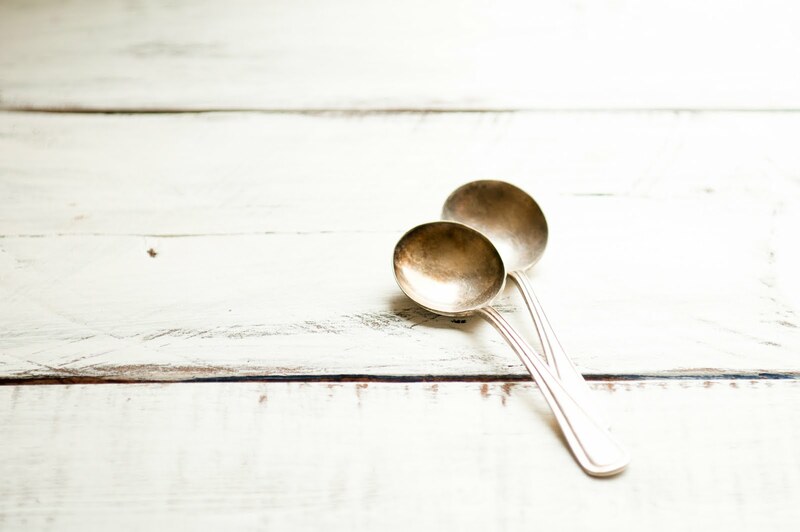 Look at those vintage spoons? @Averie: I made avocado ice cream once but it turned out just *too* avocado-y. Like the sound of something more mellowed out, with vanilla and banana. @girlleastlikely: I would have never thought oil would work in cookies, but now I'll have to give it a try! When my kids were young and wanted dessert, sometimes I would make a shortbread (I know, not very healthy), and put just a very small piece in a bowl and then cover it with lots and lots of fruit (bananas were a favorite). It was better than cookies or cake! This look soooo good!! I love the colours! I think you've got me caving fruit crisp now. oh my gracious..this looks heavenly! i love your combination of fruit and flavors! There is something so comforting about a crisp. 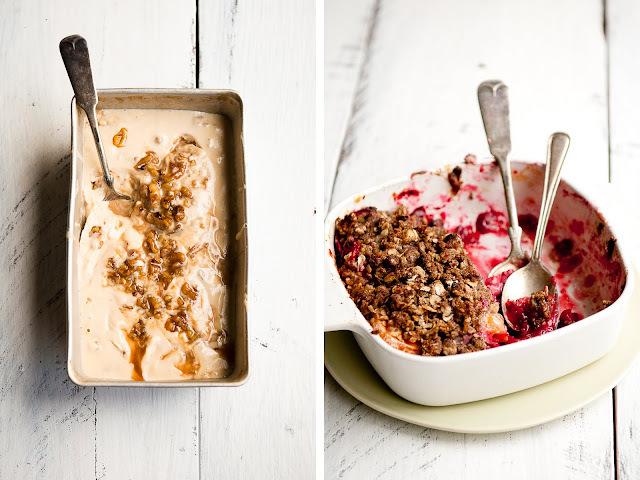 Even on a summer night, I enjoy devouring a heaping scoop of warm fruit and nutty crumble topping. But that maple nut froyo. How perfect is that? 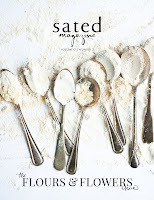 Great to have found your site, the delectable recipes, and gorgeous photography. Look forward to following your journey in the kitchen. Thank you for sharing.